Have you noticed that you can only delete the contact one by one with the Contacts app on your iPhone, which is annoying if you have got a group of contacts or all the contacts to wipe out. Actually, you don’t need to do so, as there are different ways to bulk delete iPhone contacts including deleting multiple contacts with the Group App, deleting all the contacts through the Contacts app on the Mac and deleting from iCloud. Now let’s get down to the details. 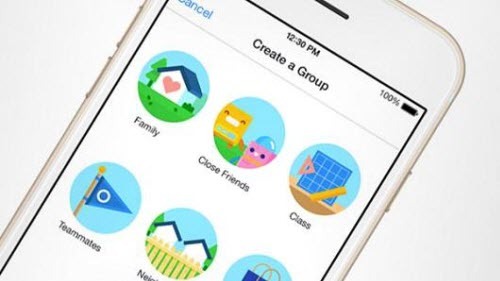 If you just want to delete a group of contacts from your iPhone, you can turn an app Group which you can download from App Store. Below are the elaborated introduction. > Download the launch the Groups app to your iPhone from the App Store. > Allow Groups access to your contacts when prompted. > Go through your contacts and mark the ones you’d like to delete by tapping on the circle outline to the left of their name. > Tap Actions at the top. > Tap on Delete contacts in the popup menu. > Tap on Remove from my iPhone! Voila! It is done. Now you can head on to the Contacts app on your iPhone to make sure that the selected contacts were virtually gone. Provided that your iPhone and Mac shares the same iCloud account, you can bulk delete all the contacts from iPhone and from iCloud easily. In this way, you are goping to wipe out all the contacts from not only your iPhone but also from any other devices sharing the same iCloud account. This is almost a nuclear option. Do remember to back up all the iPhone contacts before getting started to delete all the contacts permanently. Here I would like to recommend a third party software iFonebox, with which you can export all the iPhone contacts to your computer for backup selectively. Here is how. > Preview the exported contacts items and select all the transfer to your computer by clicking on “ Recover to PC”. 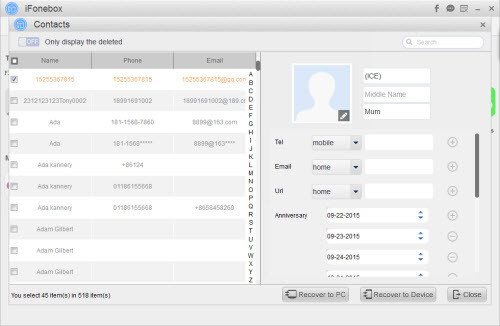 Now let’s dive into the process of deleting all the contacts through Contacts App on Mac OS X. > Launch Contacts app after locating it in /Applications/, in older versions of OS X it will be named “Address Book”. > Click File and you will be presented with options. > You can choose to Select All to wipe out all the names, phone numbers and other data. Or you can choose to delete one by one with the option of “Delete Cards”. > Confirm that you want to delete the selected cards by clicking “Delete”. Delete all the contacts in this way means the contacts on your Mac, iPhone and iCloud will also be gone instantly and simultaneously, there is no backup or address book for retrieving. Think it over and over again to make sure you are absolutely want to remove all the cards. If you have enabled the iCloud syncing option for contacts, you are able to wipe out all the iCloud contacts stored on your iPhone. Here is how. > Go to Settings > iCloud. > Switch “Contacts” off. 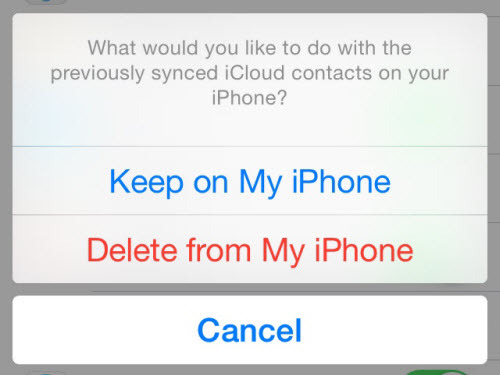 You will be prompted to delete all of the iCloud contacts stored locally on your iPhone. > Select “Delete from My iPhone”. 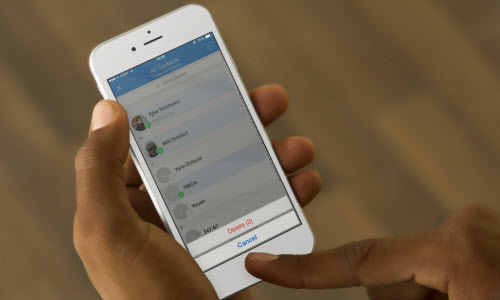 All of the contacts that you had synced with your iCloud account will be deleted from your iPhone. > Check other email accounts. 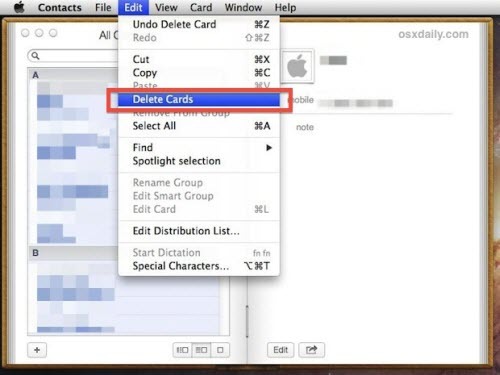 By this way, you can delete contacts synced from other email addresses. This is the ultimate way to erase the contacts totally from your iPhone. With a factory resetting you will loss everything currently on your iPhone which may sound OK if you prefer a new and clean iPhone. The most annoying side affect of doing so is that once the iPhone is hooked up to the same iCloud account again, all contact data will just resync back onto the device. You will be pissed off! This entry was posted in Contacts, iPhone, MacBook and tagged back up iphone contacts before deleting, bulk delete iphone contacts, delete iphone contacts, delete multiple iphone contacts by IosdroneD. Bookmark the permalink.